Most wine stories (including mine) portray the bottle of wine on your table as a product of inspiration and craftsmanship. 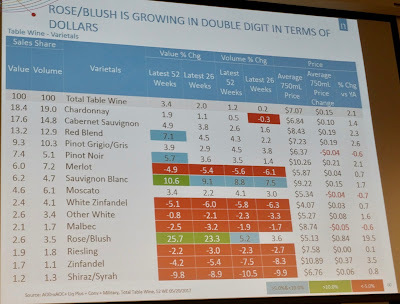 The reality of wine involves a lot more numbers than feelings, as I learned last week when I sat in on part of the OIV Wine Marketing Program at UC Davis. Most of the students are already in the wine industry in many countries; for example, I met the Jackson Family Wines rep for China. These are not people on student loans. I got into a conversation with a man who is trying to find a Napa Valley winery to buy, but not just any winery: he wants one of the best. The people who sat on my row, seemingly as depressed as I was by the Constellation presentation (more on that below), were both small winery owners in California: one in San Francisco and one in Nevada City. The San Franciscan was hoping to figure out how to sell the 500 cases a year he makes in a warehouse. I tried to help the Nevada City couple edit their elevator pitch: "You're not making wine in Nevada City," I said. "You're making natural wine from cool-climate grapes from Mendocino County." Both of these are true, but to me, only the latter gets you $25 a bottle. The course (which costs $2475) runs two weeks, but I attended only two days on Brand Management and Channels of Distribution. I was most interested in the latter. How does a small winery deal with the US's terrible three-tier system? How does OIV explain to a Greek vigneron that getting your wine to New York doesn't mean anything whatsoever in Florida or Arizona? 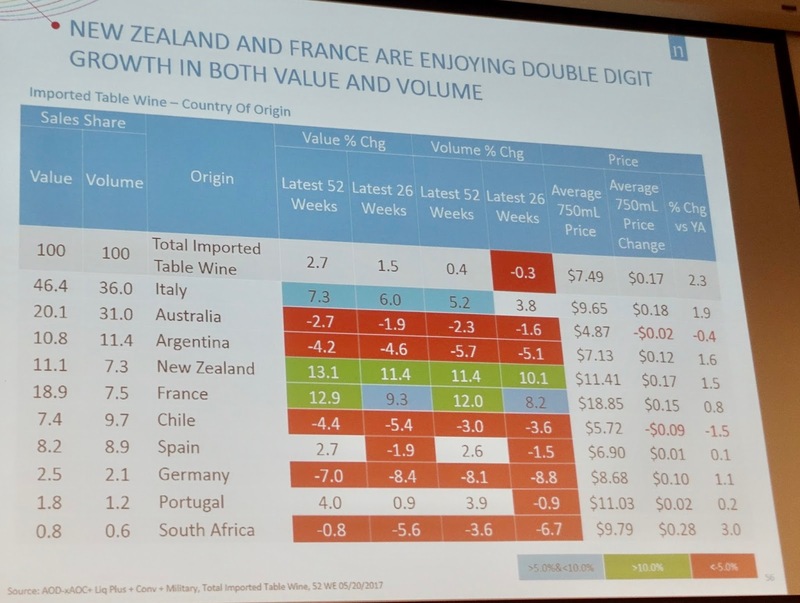 John Collins, CEO of a company called GreatVines that sells alcohol distribution software, started the week off with a slap in the face to all wine companies: "None of the wine companies are getting any attention (from distributors). Period. Because the spirits companies are that important to the distributors." Collins compared the profit size of Diageo, a huge spirits company, to Jupiter. Gallo, the largest wine company, is Neptune. And if Gallo doesn't matter to a big distributor like Southern Glazer's, no wine company does. That also apparently applies to Constellation Brands, which now sells nearly four times as much beer as wine. Yet don't sleep on Constellation: they know everything about you. I wanted to go live in a yurt after listening to the presentation by Karena Breslin, Constellation's vice president of digital marketing. Constellation spends $51 million a year on digital advertising now, up from $4 million 7 years ago. In the past, Breslin says, Constellation often paid for billboard space to reach a single person. They'd find out which route a Safeway wine buyer took to work and put a billboard for one of their wine products there. Now, they follow you -- yes you, because you once bought wine or searched for information about wine -- everywhere, with cookies on your phone and computer and data from your credit card and grocery store loyalty cards. Last year Constellation ran a campaign in Dallas and Houston for an interesting reason: to bring up the price of Kim Crawford wine product. Ads popped up on people's phones when they were close to grocery stores. Before the campaign, Constellation advised retailers to jack up the price of Kim Crawford. Breslin says the $1.7 million campaign was very successful: "for every dollar spent in digital advertising, we got $3 back." Think about it: most companies advertise lower sale prices. Constellation advertised HIGHER sale prices, and it worked. A student asked, "Why don't you do a campaign everywhere?" Indeed, a Constellation video said, "For 2018, we'll continue to outspend the competition." 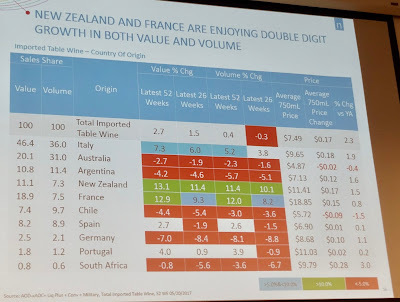 The opposite of Constellation was a presentation by Bruno Walker, director of sales and marketing for Chambers and Chambers Wine Merchants, a California distributor with an outstanding fine wine portfolio. Walker was one of several speakers to caution people that large distributors won't do much to sell wines by small wineries. "if your wine is not on some kind of special of the month, it won't sell" at a big distributor, Walker said. "That sales person is not out making presentations of your wine. Their manager is telling them, you've gotta sell this and you've gotta sell that. That's how their bonuses work. That's how they're hired and fired." But Walker also chilled expectations for what a distributorship like his can do. "The reality is, I have 15,000 unread emails," he said. "Most people are really, really busy." He said that when his salesmen present wines to stores or restaurants, they only have about 45 seconds per wine. "We have to be able to deliver a compelling story, quickly," he said. He also said -- bless you, Bruno -- that sales people should never tell wine professionals what flavors they're tasting. They might tell a sommelier where the wine would fit on a list -- light white, full-bodied red -- but beyond that, they should talk about what makes the wine unique. And they need to be aware of the local market, which is more complex than non-Americans realize. "In San Diego, big bold Chardonnay is very well-received," he said. "In downtown San Francisco, it's as if you had an STD." Jim Cahill of Rutherford Wine Company revealed trade secrets about wine pricing. * When you order wine by-the-glass in a restaurant, that glass usually costs more than the restaurant paid for the entire bottle. Restaurants like to make 80% profit on wines by the glass. Wineries like to sell their wines to by-the-glass programs because that moves a lot more wine. * A wine that costs $20 in a store brings the winery only $8.75 gross revenue. The rest goes to transportation, taxes, and mostly distributor and retailer profit. * Wineries that distribute nationally should set their prices by wherever the taxes are highest (North Carolina is up there.) That way, they can sell their wine for $15 (for example) in every state, and simply take higher profits in low-tax states like California. 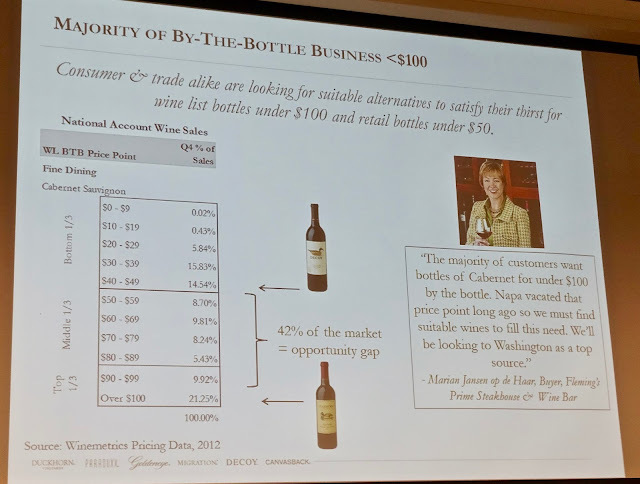 One final takeaway: people in the wine trade are talking about whether or not Napa Cabernets are pricing themselves out of the market. Duckhorn created a brand (Canvasback) on Red Mountain in Washington because it needed a $40 retail Cabernet, which might sell for $100 in restaurants, and didn't think it could easily make one in Napa. "Due to supply and demand dynamics, Napa Cab prices have exceeded what some are willing to pay," said Belinda Weber, a marketing director for Duckhorn Wine Company. Walker echoed that, saying, "Is Cabernet still king? Among collectors, yes it is. But you look at restaurant wine lists and you see very little Napa Cabernet. It's too expensive. We have wines in our portfolio where the prices have gone up and they have a Napa Cabernet at $60. They say, that's a great value Napa Cabernet. $60? OK. As a result of Napa Cabernet prices going up, other areas are really being looked at." UC Davis teaches the OIV Wine Marketing Program every year. Here's the page for details. The money these days is in spirits -- not wine. How else does one explain this purchase price? "Diageo to Pay Up to $1 Billion For George Clooney's Tequila"
Bob - you are 2000% correct. John Collins is a great guy and that quote is so on point.